While you may be increasing your workouts for bathing suit season, your elderly loved one may have stopped being active altogether. This lack of elderly exercise can be detrimental to their health and well-being. There are legitimate barriers to why some older adults no longer exercise or lose their motivation. At Aegis Living, we want to offer some solutions to overcoming these barriers, and encourage physical activity for the elderly. Before your loved one starts with an exercise program or increases their activity, it is best to consult with their health care provider, particularly when there are illnesses or disabilities to consider. Discomfort and pain. One-half of older adults is not active due to discomfort and pain. Back pain, sore knees, heart conditions, and lung disorder can be barriers to exercise and limit motivation. Also, overweight and obesity can be major problems in influencing healthy activity in older adults. How to overcome: We recommend that they speak with their health care provider about the discomfort and symptoms. Discomfort and pain can be managed through medication and alleviated with physical therapy. The key is to work with a therapist who can suggest a wide variety of exercises to match their energy or functional level on any given day. Chronic conditions, such as heart disease, arthritis, and diabetes can benefit from low exertion exercise and flexibility training. In many cases of discomfort, elderly exercise options like water aerobics is a good option to lessen joint impact. Fear of injury. Injury is a very legitimate concern for the elderly. But a lack of exercise can cause general functional decline and balance issues.How to overcome: With appropriate equipment, assisted devices, and supervision, balance and strength training can greatly assist elderly exercise which may reduce their fall risk. Start exercise programs slowly and avoid overdoing it in the beginning to build confidence. It is important that the risk of injury does not become the rationale for not exercising. Fixed income. Gym, health club memberships, and personal training can be expensive for a senior on a fixed income. Seniors may not feel that they have the means to exercise because of lack of extra funds. How to overcome: Walking is a great, free option to stay active, whether to the park, around the block, or even off the couch within their home. Also performing household chores, like mowing the lawn, vacuuming, or scrubbing the floors, can contribute to overall fitness and health. Try putting on their favorite music and dancing in the living room or while cooking dinner. Many senior centers offer classes at reasonable prices or join a local mall walking group to beat the heat or stay out of the rain. Cognitive decline. Those who are experiencing memory loss or cognitive decline still may be physically healthy and capable of exercising. How to overcome: Physical exercise is essential for maintaining blood flow to the brain and may stimulate brain cell growth and survival. Make exercise a habit by incorporating activity into their daily routine. Keep the exercise simple, such as walking, climbing stairs, or simple stretching. Repetition of activity may be key to become a habit. Isolation: Most people, not only aging adults, are more successful at an exercise program if they workout with a partner. If your loved one has lost a spouse or their partner is physically disabled, they may lose their motivation to stay active. Sometimes older adults may feel vulnerable and unsafe walking alone. 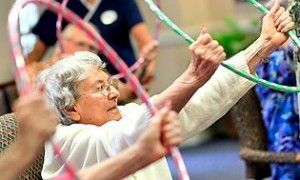 How to overcome: Find a local senior citizen organization that offers group activity and fitness classes. Family and friends can help them stay motivated or train with them. Another option may be to consider a personal trainer or physical therapist to help identify exercises that they find enjoyable and are self-motivated to do. Another motivator is to set achievable goals, such as playing with their grandchild on the floor or working in the garden.